Members of New Zealand's House of Representatives, commonly called "Parliament", normally gain their parliamentary seats through nationwide general elections, or (less frequently) in by-elections. General elections normally occur at least every three years in New Zealand, and operate using the Mixed Member Proportional electoral system. The Chief Electoral Office and the Electoral Commission co-ordinate the electoral system. Local government politicians, including mayors, councillors and District Health Boards are voted in during the local elections, held every three years. These elections used both Single Transferable Vote and First Past the Post systems in 2007. The first national elections in New Zealand took place in 1853, the year after the British government passed the New Zealand Constitution Act 1852. Women's suffrage was introduced in 1893, with New Zealand being the first country to do so. Ballot boxes at the Linwood Library, Christchurch, for the 2014 election. The white leftmost box is for special votes, with the orange boxes being for ordinary votes for the (from left to right) Te Tai Tonga, Port Hills, Christchurch Central and Christchurch East electorates. A voting screen can be seen to the left. New Zealand general elections occur when the Prime Minister requests a dissolution of Parliament and therefore a general election. Theoretically, this can happen at any time, although a convention exists whereby Prime Ministers do not call early elections unless they have no reasonable alternative. Elections always take place on a Saturday, so as to minimise the effect of work or religious commitments that could inhibit people from voting. Voting (the casting of ballots) happens at various polling stations, generally established in schools, church halls, sports clubs, or other such public places. Polling booths are also set up in hospitals and rest homes for use by patients. The 2005 election made use of 6,094 such polling stations. Voters may vote at any voting station in the country. Advance voting is available in the two weeks before election day. If voters cannot physically get to a polling place, they may authorise another person to collect their ballot for them. Overseas voters may vote by mail, fax, internet or in person at NZ embassies. Disabled voters can choose to vote via a telephone dictation service. 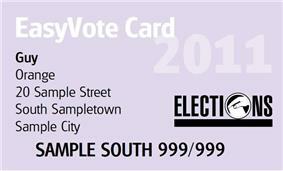 Voters are encouraged to bring with them the EasyVote card sent to them before each election, which specifies the voter's name, address, and position on the electoral roll (e.g. Christchurch East 338/23 means the voter is listed in the Christchurch East electorate roll, on line 23 of page 338). However, this is not required, voters may simply state their name and address to the official. The voting process uses printed voting ballots. After the voting paper is issued, the voter goes behind a cardboard screen, where they mark their paper using a supplied orange ink pen. The voter then folds their paper and places in their electorate's sealed ballot box. Voters who enrol after the rolls have been printed, voting outside their electorate, or on the unpublished roll casts a "special vote" which is separated for later counting. According to a survey commissioned by the Electoral Commission, 71% of voters voted in less than 5 minutes and 92% in less than 10 minutes. 98% of voters are satisfied with the waiting time. Campaigning is prohibited on election day. All election advertisements must be removed or covered by midnight on the night before the election. Opinion polling is also illegal on election day. Local elections are by mail. Referenda held in conjunction with elections are held at polling stations, between elections may be done by mail or at polling stations at the government's discretion. New Zealand general elections generally occur every three years. Unlike some other countries, New Zealand has no fixed election-date for general elections, but rather the Prime Minister determines the timing of general elections by advising the Governor-General when to issue the writs for a general election. The Constitution Act 1986 requires new parliamentary elections every three years, unless a major crisis arises or the Prime Minister loses the ability to command a majority in parliament. The 1910s, 1930s and 1940s saw three elections delayed due to World War I, the Great Depression and World War II, respectively: the 1919, 1935 and 1943 elections would otherwise have taken place in 1917, 1934 and 1941 (Parliaments passed Acts extending their terms). The term of Parliament and the timing of general elections is set out in the Constitution Act 1986 and the Electoral Act 1993. Under section 19 of the Constitution Act, Parliament must meet within six weeks of the return of the writs for a general election, while under section 17, the term of Parliament ends three years after the return of the writs, unless Parliament is dissolved earlier by the Governor-General. Section 125 of the Electoral Act requires that whenever Parliament expires or is dissolved, the Governor-General must issue a writ of election within seven days. Section 139 of the Electoral Act provides further constraints. The writ must be returned within 50 days of being issued, though the Governor-General may appoint an earlier return date in the writ itself. Furthermore, polling day must be between 20 and 27 days after the close of nominations. Thus, New Zealand law requires elections at least once every three years and two months, though elections are often held after three years, traditionally in November. The extra two months allow for some flexibility when returning to a fourth-quarter election after an early election, as happened in 2005 and 2008 after the 2002 snap election (see below). Early or "snap" elections have occurred at least three times in New Zealand's history: in 1951, 1984 and 2002. Early elections often provoke controversy, as they potentially give governing parties an advantage over opposition candidates. Note that of the three elections in which the government won an increased majority, two involved snap elections (1951 and 2002 – the other incumbent-boosting election took place in 1938). The 1984 snap election backfired on the government of the day: many believe that the Prime Minister, Robert Muldoon, called it while drunk. See Snap election, New Zealand. The 1996 election took place slightly early (on 12 October) to avoid holding a by-election after the resignation of Michael Laws. The Prime Minister's power to determine the election date can give the government some subtle advantages. For example, if governing parties believe that a section of the population will either vote against them or not at all, they might hold the election in early spring, when the weather may well keep less-committed voters away from the polls. Party strategists take the timing of important rugby union matches into account, partly because a major match in the same weekend of the election will likely lower voting-levels, and partly because of a widespread belief that incumbent governments benefit from a surge of national pride when the All Blacks (the New Zealand national rugby team) win and suffer when they lose. Tradition associates elections with November – give or take a few weeks. After disruptions to the 36-month cycle, Prime Ministers tend to strive to restore it to a November base. In 1950, the legal requirement to hold elections on a Saturday was introduced, and this first applied to the 1951 election. Beginning with the 1957 election, a convention was formed to hold general elections on the last Saturday of November. This convention was upset by Robert Muldoon calling a snap election in 1984. It took until the 1999 election to get back towards the convention, only for Helen Clark to call an early election in 2002. By the 2011 election, the conventional "last Saturday of November" was achieved again. However, the 2014 election occurred on 20 September. Unlike general elections, elections for the city, district and regional councils of New Zealand have a fixed election date. Under section 10 of the Local Electoral Act 2001, elections must be held on the "second Saturday in October in every third year" from the date the Act came into effect in 2001. The last local body elections were held on 12 October 2013. The next will be held on 8 October 2016. A party that has more than 500 fee-paying members may register with the Electorate Commission. Registered parties may submit a party list on payment of a $1000 deposit. This deposit is refunded if the party reaches 0.5% of the party votes. Electorate candidates may be nominated by a registered party or by two voters in that electorate. The deposit for an electorate candidate is $300 which is refunded if they reach 5%. The electoral roll consists of a register of all enrolled voters, organised (primarily alphabetically by surname) within electorates. All persons who meet the requirements for voting must by law register on the electoral roll, even if they do not intend to vote. To be eligible to enrol, a person must be 18 years or older, a New Zealand citizen or permanent resident and have lived in New Zealand for one or more years without leaving the country (with some exceptions). People can provisionally enrol to vote once they turn 17, with them being automatically enrolled on their 18th birthday. The roll records the name, address and stated occupation of all voters, although individual electors can apply for "unpublished" status on the roll in special circumstances, such as when having their details printed in the electoral roll could threaten their personal safety. The roll is "public information" meaning it can be used for legitimate purposes such as selecting people for jury service but it can be abused especially by marketing companies who use the electoral roll to send registered voters unsolicited advertising mail. According to Elections New Zealand, "having the printed electoral rolls available for the public to view is a part of the open democratic process of New Zealand". New Zealanders refer to voting districts as "electorates", or as "seats". Following the work of the 2014 Representation Commission review, New Zealand from 2014 on will have 71 geographical electorates. The Commission moved boundaries in west Auckland to abolish the Waitakere electorate and establish the new electorates of Upper Harbour and Kelston. The 71 electorates include 7 Māori electorates specially set up for people of Māori ethnicity or ancestry who choose to place themselves on a separate electoral roll. All electorates have roughly the same number of people in them – the Representation Commission periodically reviews and alters electorate boundaries to preserve this approximate balance. The number of people per electorate depends on the population of the South Island – this, currently the less populous of the country's two main islands, has sixteen guaranteed electorates, so the ideal number of people per electorate equals the population of the South Island divided by sixteen. From this, the Commission determines the number of North Island, Māori and list seats, which may fluctuate accordingly. Polling places close at 7.00pm on election day and each polling place counts the votes cast there. The process of counting the votes by hand begins with advance and early votes from 2pm. From 7.00pm, results (at this stage provisional ones) go to a central office in Wellington, for announcement as they arrive. Starting from 2002, a dedicated official website, "www.electionresults.govt.nz" has provided "live" election result updates. The provisional results from polling places and advance votes will generally become available from 7:30pm, with advance vote results usually released by 8:30pm and all results by midnight. The ballots are then transported back to the Returning Officer for the electorate for a mandatory recount. The electoral rolls are checked to make sure no one votes more than once. Special and overseas votes are also included at this stage. The final count is usually completed in two weeks, occasionally producing surprise upsets. In 1999 the provisional result indicated that neither the Greens nor New Zealand First would qualify for Parliament, but both parties qualified on the strength of special votes, and the major parties ended up with fewer list seats than expected. The final results of the election become official when confirmed by the Chief Electoral Officer. Referenda by mail are scanned into a computer system but not counted until the close of polling. When the poll closes at 7.00pm, the scanned ballots are counted and the results announced soon after. The following table lists all previous general elections held in New Zealand (note that elections for Māori seats initially took place at different times from elections for general seats). The table displays the dates of the elections, the officially recorded voter turnout, and the number of seats in Parliament at the time. On the right the table shows the number of seats won by the four most dominant parties in New Zealand's history (the Liberal Party and the Reform Party, which later merged to form the National Party, and the Labour Party), as well as the number won by other candidates (either independents or members of smaller political parties). Bold indicates that the party was able to form a government. * The Liberal Party lost their majority in the 1911 election; however, due to the lack of a majority, they were able to stay in power until a vote of no confidence resulted in the formation of the Reform Government in 1912. ** The United Party (a regrouping of the Liberals) and the Reform Party contested the 1931 and 1935 elections as a coalition, but did not formally merge as the National Party until 1936. *** Due to major problems with the enrolment process, commentators generally consider that the 1978 election had a significantly higher turnout than official figures indicate. 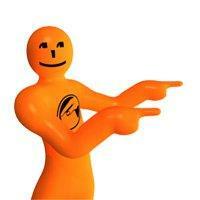 Orange Guy is the mascot used in all electoral related advertising by the Electoral Commission. He is an amorphous orange blob who usually takes on a human form, but can transform into any object as the situation warrants. His face is a smiley, and his chest sports the logo of the Electoral Commission. Both the Electoral Commission logo and Orange Guy icon are trademarked to the Electoral Commission. ^ , Elections New Zealand, Enrolling – FAQ. Retrieved 5 April 2009. ^  Elections New Zealand, Viewing the printed electoral rolls. Retrieved 5 April 2009.